Cool car style of flash catalog templates are pre-designed for you. Are you a car fan? Would you like to own cool car templates to decorate your cars brochure, company brochure, flash catalog, digital book, flash magazine and so on? About car, there are a lot of brands, which kind of car you would like? I am a car fan, especially for Aston Martin. Different people have different taste, but no matter what kind of car we like, we have a same name - car fan. Have you been to cars fair? Company would make advertisement from fair, but it would cost a lot of money. 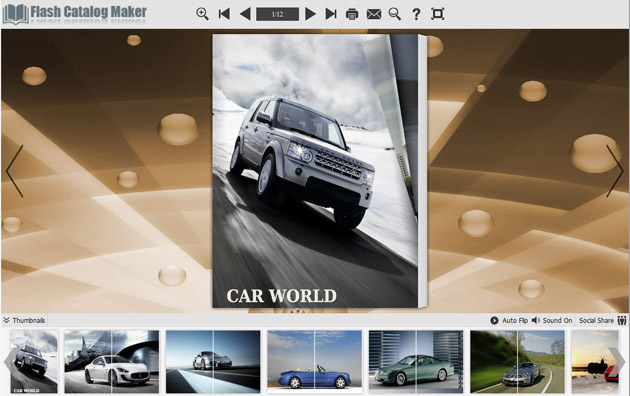 So from us, we have developed a catalog maker to create digital catalog with flipping pages and impressive appearance which would catch viewers' eyes.Just like car, we would be attracted by the car with fantastic appearance, then we would consider its functions. Come to us now, everybody can get these free impressive flash catalog templates to make flash catalog more attracted. Top 4 Download periodically updates software information of Flash Catalog Templates of Cool Car 1.0 full version from the publisher, but some information may be slightly out-of-date. Using warez version, crack, warez passwords, patches, serial numbers, registration codes, key generator, pirate key, keymaker or keygen for Flash Catalog Templates of Cool Car 1.0 license key is illegal and prevent future development of Flash Catalog Templates of Cool Car 1.0. Download links are directly from our mirrors or publisher's website, Flash Catalog Templates of Cool Car 1.0 torrent files or shared files from free file sharing and free upload services, including Rapidshare, HellShare, HotFile, FileServe, MegaUpload, YouSendIt, SendSpace, DepositFiles, Letitbit, MailBigFile, DropSend, MediaMax, LeapFile, zUpload, MyOtherDrive, DivShare or MediaFire, are not allowed! Your computer will be at risk getting infected with spyware, adware, viruses, worms, trojan horses, dialers, etc while you are searching and browsing these illegal sites which distribute a so called keygen, key generator, pirate key, serial number, warez full version or crack for Flash Catalog Templates of Cool Car 1.0 download. These infections might corrupt your computer installation or breach your privacy. A keygen or key generator might contain a trojan horse opening a backdoor on your computer. Hackers can use this backdoor to take control of your computer, copy data from your computer or to use your computer to distribute viruses and spam to other people.